So yesterday was Day 2 of the 20 Day Holiday Workout Challenge and I really didn’t allow myself much time for a good workout. Therefore, I’ve decided I need to start making a to-do list each day. Especially right now. The end of the semester is coming up so I need to wrap all things school-related. I need to make sure to get in a workout every day. I have to work on stuff for WI Chapter Girls’ Pint Out. Christmas is coming and I haven’t done a lick of shopping. And I also need to allow myself time to make at least one meal at home per day. Working in a restaurant with really great food is such a bad thing. Well, it’s a good thing but it’s just so easy to never buy groceries and rely on my place of employment to feed me daily. But this means extra money and generally extra calories, though The Great Dane does offer some awesome healthy/organic/local choices. It’s just that the less healthy/less organic/less local options always seem to speak to me at the end of a grueling shift. I would share with you my list for today, but I need to get to it. I worked late last night so I slept in this morning. 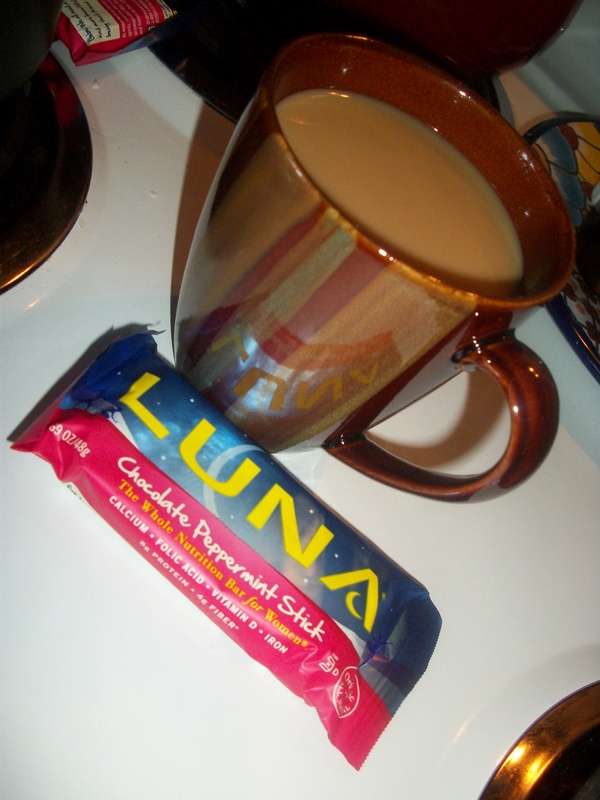 Luckily I started my day with half a pot of Archer Farms Pumpkin Spice coffee (which really tastes nothing like Pumpkin Spice, but it wasn’t awful) and Chocolate Peppermint Stick Luna Bar so I’m ready to go! Oh, and just because I feel the need to hold myself accountable…this is what I DID have time for in terms of “working out” yesterday. I took Fielder for a walk, about 3 blocks, and did 25 crunches. No, not really a workout, but at least I moved around a little? Next Post Day 3 Food and… Fitness?